Our mission statement: We’ll look after the dust while you look after your clients. You won’t need a wood working, blasting and paint facility – we have it covered. 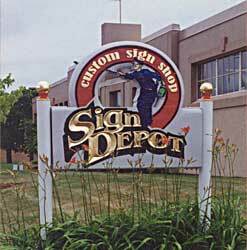 The Sign Depot Wholesale was created to help and service other sign companies. We work in woods, urethane foams and plastics and offer signs finished ready for installation or ready for your finishing touch. Estimates are supplied within 1 working day and most sign orders can be shipped anywhere within 10 to 15 days. The Sign Depot Wholesale makes supplying traditional carved wood and v-cut signs easy.